A 5-7 day road bike trip. 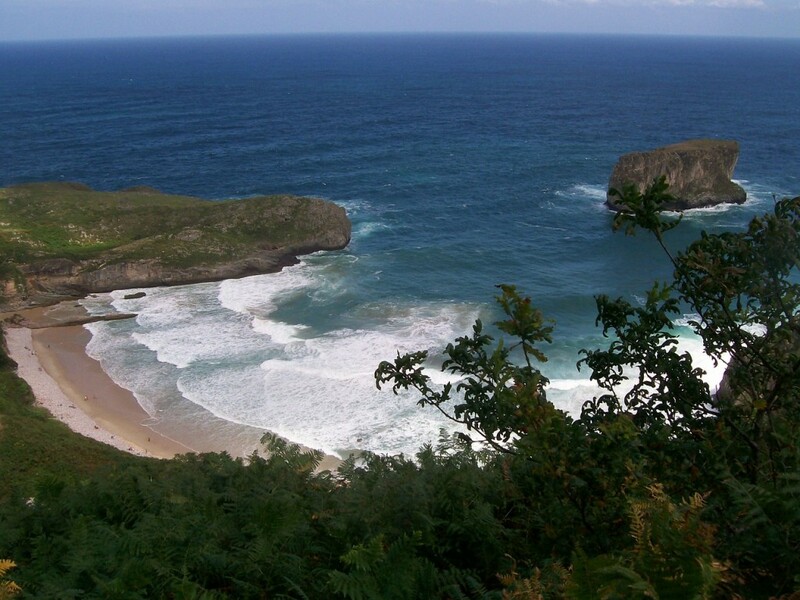 This route takes in the Atlantic coast of Spain with its surf beaches and lush hills before heading up into the stunning limestone peaks of the Picos National Park. The Picos have dramatic peaks rising to 2,500 m, river gorges, attractive towns and villages plus some big climbs and great passes. The roads, even on the coast, are fairly quiet. There are some optional off-road sections – not technical but you’d need a mountain bike with gravel/semi slick tyres.The route. A good place to aim for if you want a shortish first day is Santillana del Mar . It’s a well preserved medieval village that is a bit touristy during the day but good to look around in the evening. There’s a campsite about 1km outside the village heading westwards. 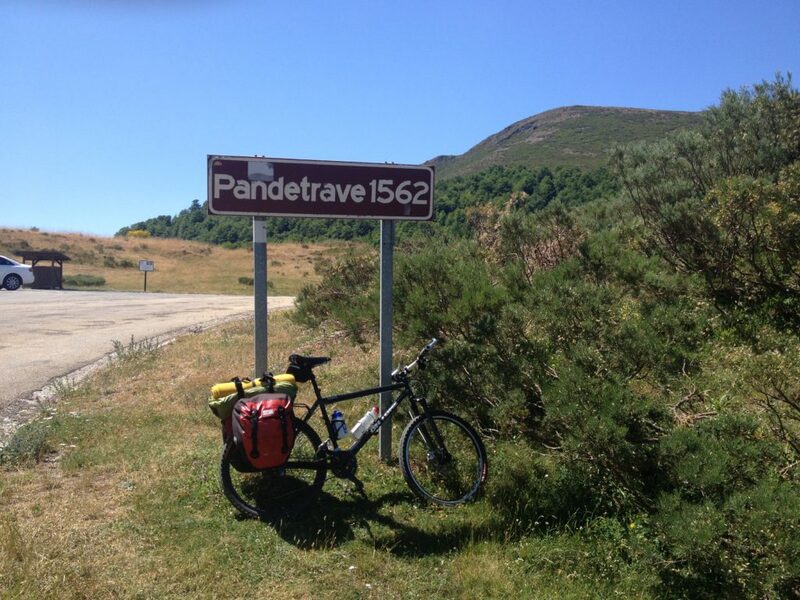 From Santillana continue riding west along the coast to San Vincent and then start heading inland to Unquera and Panes and then to Cangas de Onis. There’s a good campsite at Las Arenas and also one at Cangas de Onis. 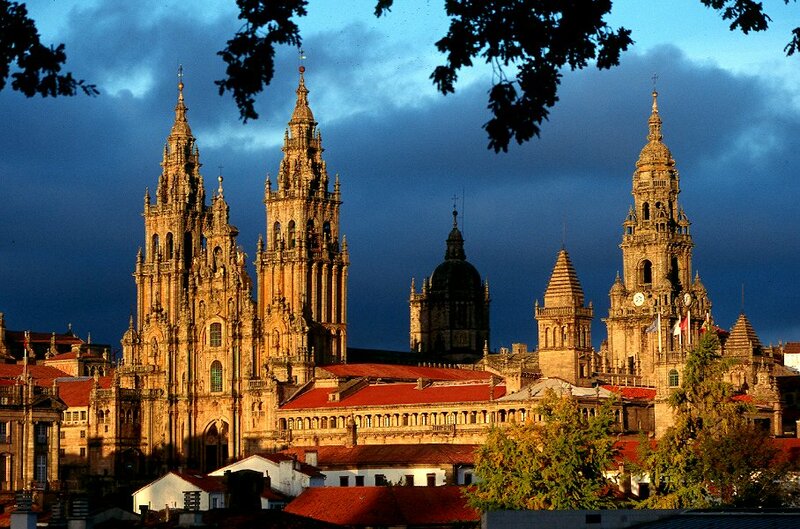 It’s worth finding a tourist office and picking up a campsite guide –the tourist offices only cover their own region – you start in Cantabria and then move into Asturias. 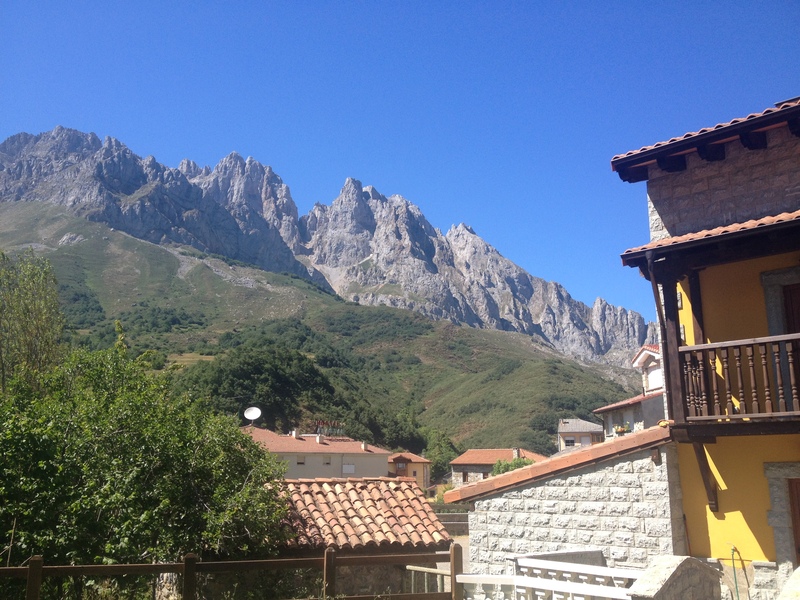 A good half-day side trip from Cangas is to climb the mountain road up to Covadonga – a steady but unrelenting 1,100 metre climb followed by an alpine-like descent the same way. This is often used as a stage finish in the Vuelta de Espana and there are reputed to be fantastic views – unfortunately the day we did it was raining and misty so we saw very little! From Cangas take the road to Posada de Valdeon – this is arguably one of the best days of the trip as it takes you into the heart of the Picos, climbing through an impressive narrow gorge bringing you ever closer to limestone peaks of the central Picos and then crossing the Puerto de Panderruedas (1,469m) before descending to Posada. A further 4km uphill takes you the hamlet of St Marina de Valdeon from where 1km uphill on a track from the village takes you to a campsite in a beautiful setting. The next stage climbs to the Puerto de Pandetrave (1,598m), then descends before climbing again to Puerto de San Glorio (1,609m). From here there is a 25+ km descent into Potes. Potes is the main town of the area and is an attractive place to re-supply. From Potes there’s a side trip up to Fuente De where there is a cable car that goes to to a viewpoint at about 1,900 m.
The Potes valley is a bit busy as it’s a popular tourist spot but for good reason. 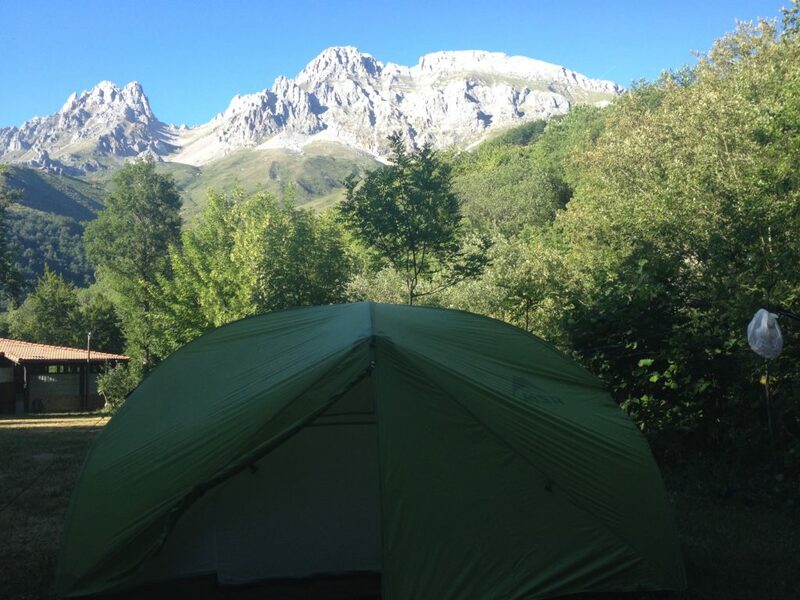 There are a number of campsites in the area – the nearest is about 1.5km from Potes in the direction of Fuente De and there’s also a campsite at the road end at Fuente De. 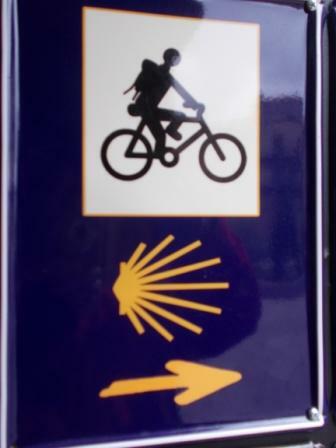 There are some off-road sections that provide variations on the road route – see the Cicerone Press cycle touring in Spain guidebook or the 1:40,000 map for details – they are listed in the guide book and map section below. From Potes you can either head back down the valley through La Hermida and Panes and hit the coast near San Vicente and then ride eastwards to Santander or continue across the eastern side of the Picos before dropping further down the coast. 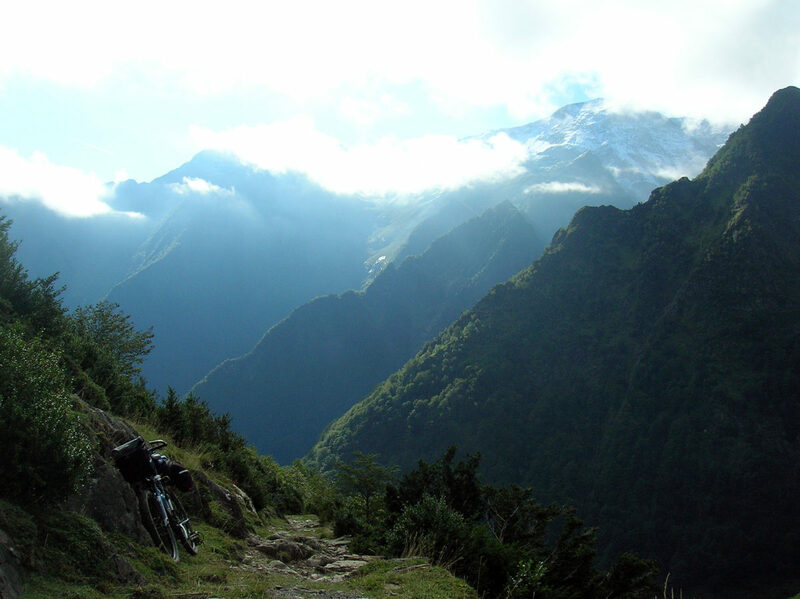 One route is to take the road from Potes northwards for about 5km down to Ojedo and then turn right to climb towards Puerto de Piedrasluengas (1,313m). Just before the pass turn left and head towards La Lastra. The road follows the Rio Nansa descending for over 30 km, passing a spectacularly situated dam before continuing to drop to Puentenasa. 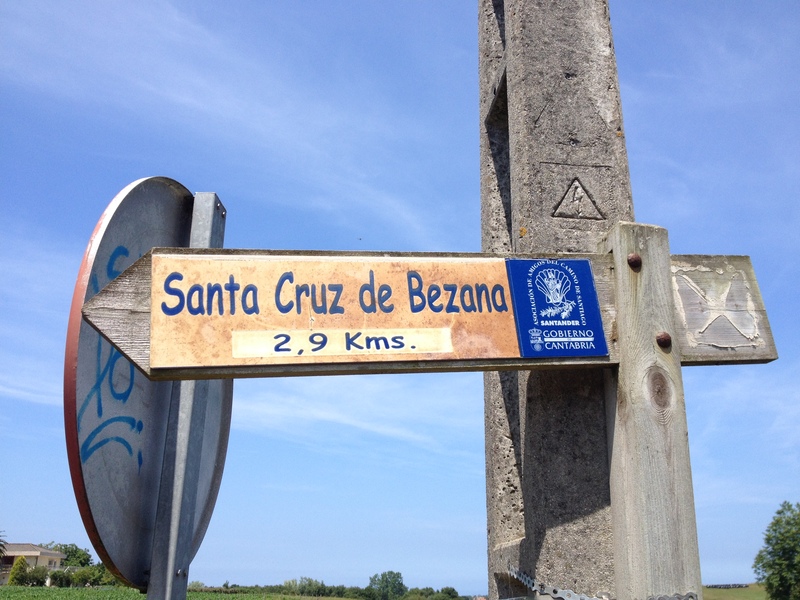 At Puentenasa there are a number of choices – continue straight on and descend out of the Picos to the coast near St Vincent. Or turn right to Carmona and continue inland and weave a route through the foothills to Santillana and then retrace your outward route back to Santander. 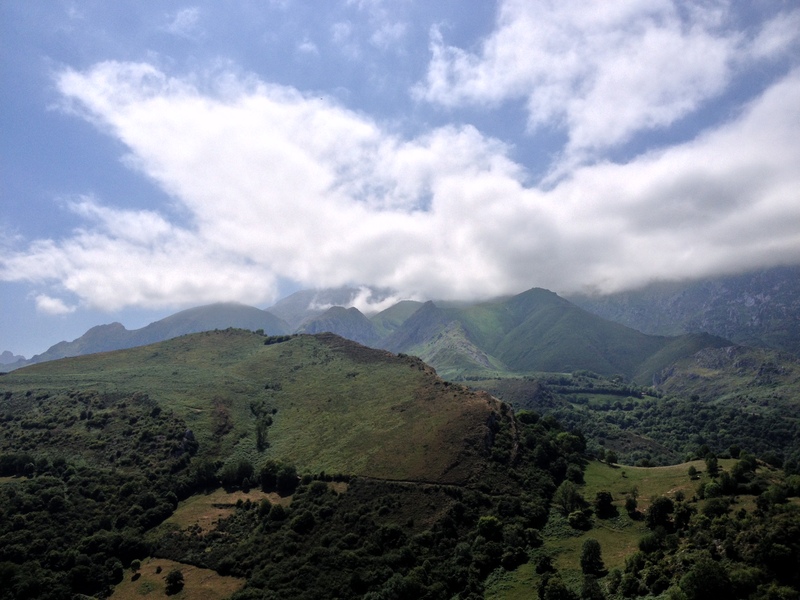 The Cicerone Press guidebook ‘Cycle Touring in Spain’ includes a tour in the the Picos which broadly follows this route http://www.cicerone.co.uk/product/detail.cfm/book/381/title/cycle-touring-in-spain#.VrYZx1KgzsE It also contains 7 other cycle tours. Alternatively, on the website you can buy a PDF of just the tours you want. The Atlantic coast of northern Spain has a maritime climate so is cooler than most parts of Spain in the summer but is still around 25 degrees. May, June and September are good months to go but also July and August are not too hot although they are the busier holiday periods. Local train. FEVE narrow gauge railway runs along the north coast between Santander and Oviedo. There are spaces for bikes on the trains and there’s no need to book.http://www.renfe.com/EN/viajeros/feve/ The FEVE station in Santander is next to the main railway station and not far from the ferry port. If you want to avoid riding into or out of Santander you can take the FEVE train to Puente San Miguel – 5 km south of Santillana and start/finish from there. 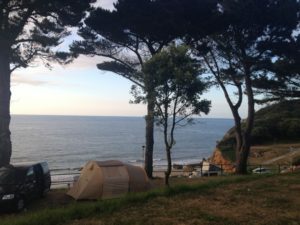 There are plenty of campsites along the coast and in the Picos national park. They tend to open from mid/late May – best to check with local tourist offices who have detailed lists of campsites.